Wayne County Michigan New Home Construction, Hawthorne Ridge by Nicholas Homes of Hawthorne Ridge, Inc.
Nicholas Homes of Hawthorne Ridge, Inc. 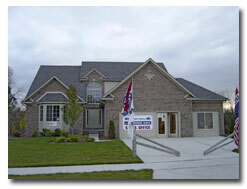 Welcome to Hawthorne Ridge Subdivision, located in the city of Flat Rock with the Flat Rock School District. Nicholas Homes of Hawthorne Ridge, Inc., your Wayne County Michigan new home construction specialist, has one last beautiful spec home available in this prestigious subdivision available for immediate occupancy. This home is fully completed and ready for viewing. Hawthorne Ridge Subdivision features over 30 acres of wooded and field nature areas that are part of the community, but will not be built upon, to give the location a country feel. Winding roads with a play-scape, picnic and volleyball area and eight foot asphalt bike trails through all 30 acresa are just some of the amenities for this community. Our sales office is no longer located within the subdivision, so please visit or call our sales models located in Hidden Oaks or Cambridge Meadows Subdivisions for details or to schedule a private showing. Hawthorne Ridge Subdivision is located off the east side of Inkster Rd., 3⁄4 mile south of Van Horn Rd., just minutes from I-75.